I’ll call this one Jack’s Black. 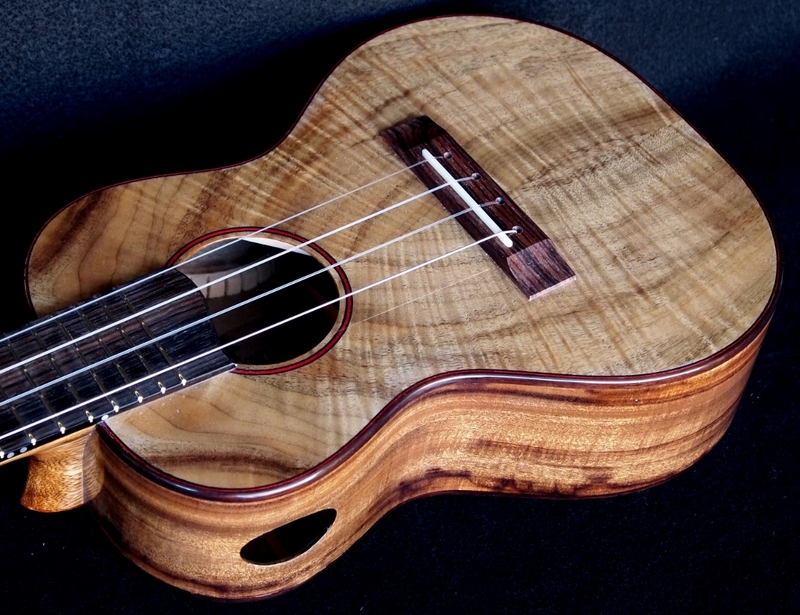 This Black Koa Tenor Ukulele with with dramatic sap wood highlights also sports a wide neck per Jack’s request. 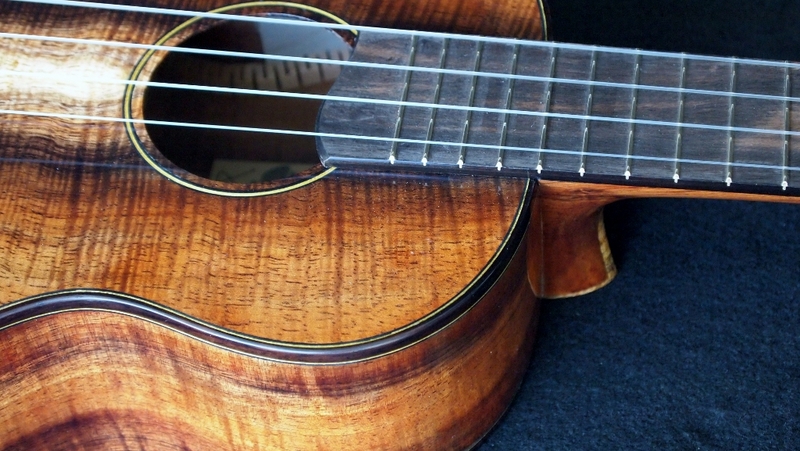 The Koa is more from my stash of reclaimed salvage from the Big Island of Hawaii. I’m a sucker for woods having a live edge of sap wood and for alternative appearances including spalt and sap wood. No doubt Jack also has an eye for the same. 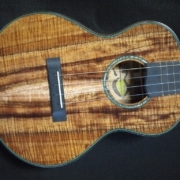 It’s not totally black but as dark as I’ve seen Koa. Jack spent a little time at the shop and personally selected this set of wood and we were off to the races. 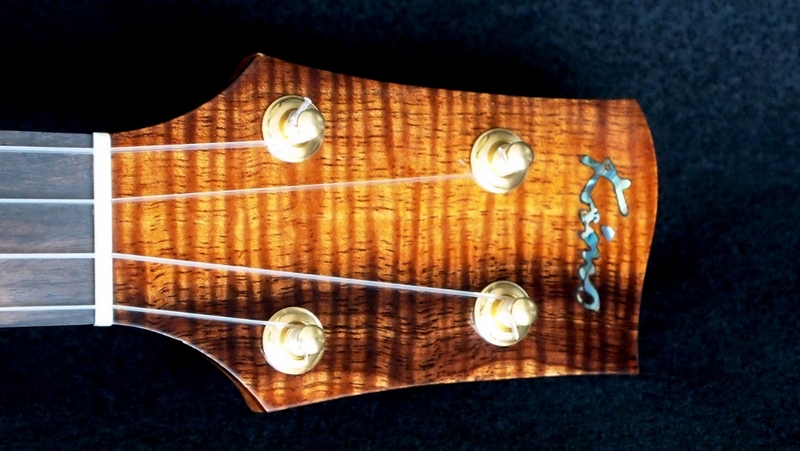 Jack also requested an all Koa neck. 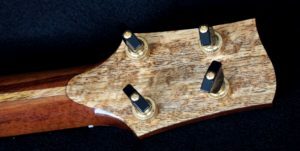 Fortunately I have some billets of 30+ year old Koa that are not suitable for back and sides so I have occasionally used this wood for necks. 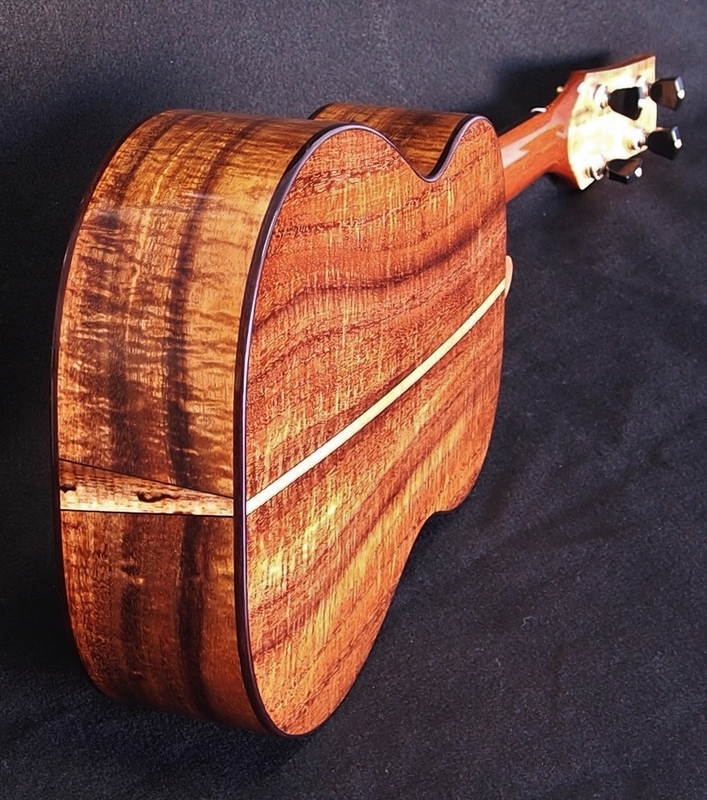 In addition, since the accent wood was mango, Jack requested a solid Mango stringer/lamination in the neck. Check! When the Koa is gone I probably won’t do any more Koa necks. I stabilize the necks with a solid carbon fiber truss rod so hopefully there will be no twisting. 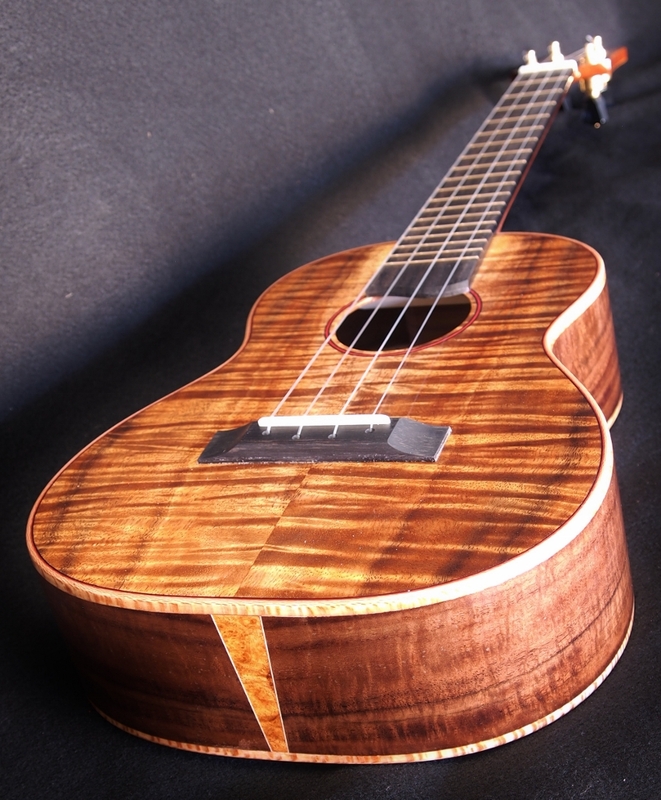 We used one of the last pieces of Munn Ebony for the finger board and bridge. 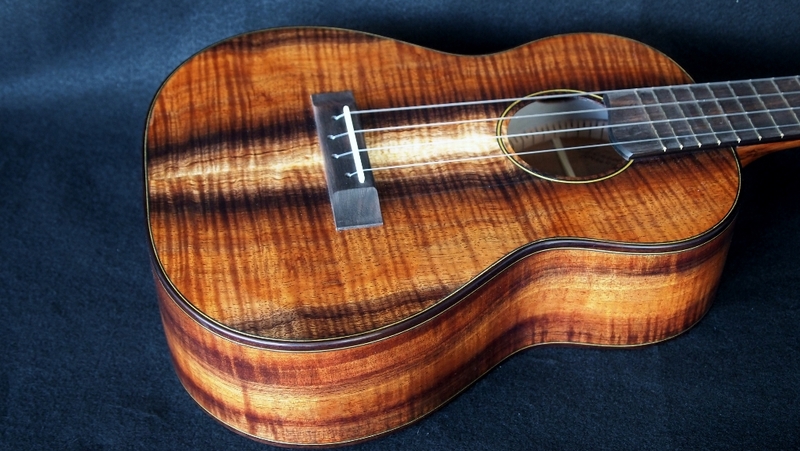 This ebony does not seem to be available anywhere now. I purchased this wood from a local source about 15 years ago. It appearance is black with brownish smokey clouds in it and it does not seem to have any pores. Oh well. 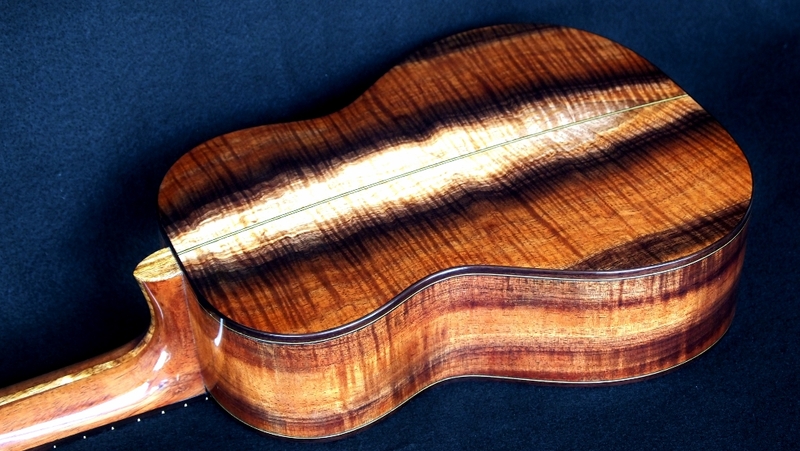 The binding is India Rosewood accented with black/yellow purfling. I thought the yellow might be too bright but it became much more subtle with finish. 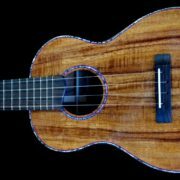 Strings are GHS flourocarbon utilizing Sarah Maisel’s Low “G” from her custom string set. This instrument is pretty bright for its size and showed good response. I think it will be huge as it breaks in. Black is in. 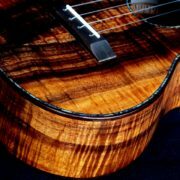 I hope I can get more of this beautiful Koa.